Water Leaking from Ceiling | Horne Heating and Air Conditioning Inc.
Once the temperatures rise and the air conditioners turn on, the phone calls start rolling in. One of the most frequent calls is about water leaking through the ceiling from a Air Conditioner. Most of the time (assuming the leak is coming from inside the home) the problem is a clogged condensate drain line. What is a condensate drain line? House fires, In some situations the leaking water can drip onto electrical components and cause fires. If water is dripping from the ceiling and your furnace and or air handler is located in the attic, the most likely cause is a clogged condensate drain line. What should I do if the AC unit in the attic is leaking water? 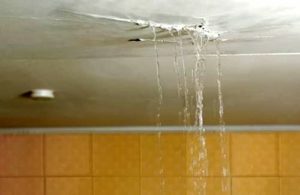 If you already have water leaking from your ceiling, call us immediately to flush out your condensate drain line or replace the drain pan. You may also wish to install a HVAC EZ Trap. This trap will automatically shut off your air conditioner is the water level reaches a certain level, protecting your home and your cooling system.